Stockholm clinched first place in the Swedish Elite Division for 2013 by taking an away doubleheader from second place Karlskoga Saturday. But it wasn’t just that they won, it was the way they totally overpowered (demolished) last year’s champions, at their diamond. Stockholm took the first game 14-1, called in eight innings because of the mercy rule. Game 2 was called after 5 innings, with Stockholm ahead 22-0. Stockholm has won the Swedish Championships two out of the past three years, but Karlskoga is no pushover. They won last year’s championships, and at the beginning of the day Saturday were just one half game behind Stockholm in the standings. This coming Saturday Stockholm plays two games against fifth place Alby, games which are less than vital as Stockholm now has a 2.5 game lead over second place Karlskoga. But Saturday’s other doubleheader is very important for Karlskoga and their opponents Leksand, as Leksand is just a half game behind Karlskoga and the outcome of those games will determine who finishes in second and third place. The top four teams go on to the play-offs. Sundbyberg is in fourth place currently and plays two games against last place Göteborg on Saturday. Should Leksand lose two, and Sundbyberg win two, they might switch places in the final standings. First place Stockholm split a doubleheader at home against Leksand Saturday June 8. Behind the fullgame pitching of Jakob Claesson, Stockholm took game 1, 11-1, winning on the mercy rule after 7 innings. But Stockholm’s Matt Nordsten gave up 6 runs in the top of the first in the game 2. At one point Stockholm fought back to one run behind at 9-8, but fell short as the final score was 14-10. Stockholm and Karlskoga split Saturday’s doubleheader and remain in a virtual tie for first place in the Swedish Elite division. Home team Stockholm shut out Karlskoga in the opener 9-0. But the defending champs came back to win the second game 8-7, in 11 innings. Stockholm won its opening day home doubleheader against Göteborg on May 1, 12-0 and 22-9. Since then Stockholm has held on to first place, with a 5-1 record going into Saturday’s home doubleheader against defending champs Karlskoga. At 6-2 Karlskoga is essentially tied for first place, just a few percentage points behind Stockholm. Why is there no MLB.tv on-demand Gameday Audio? MLB.tv is a wonderful thing. Here I am on the other side of the planet and I can watch any MLB game I want, live or on-demand afterwards, in a variety of ways. I can watch on my iPad, on my Apple TV, even my LG TV set has the MLB app built in (although it doesn’t work as well as the Apple TV app). 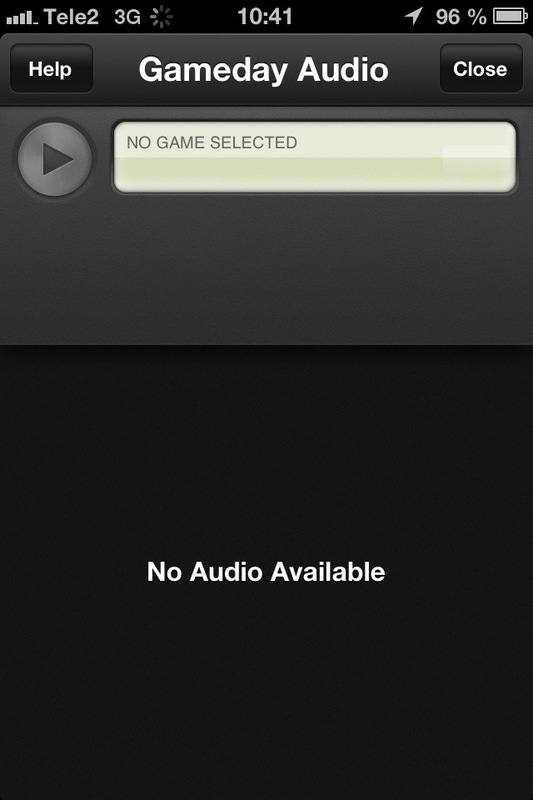 I can even watch the games on my iPhone, and listen to the radio broadcasts of the games live. But once again as in previous years, only live, you can’t listen to games on-demand afterwards. This makes no sense. I use my iPad for video, my iPhone is my listening device for radio and podcasts. Since most MLB games are on in the middle of the night my time, I would love to be able to listen to the audio during my morning commute. Weirdly, I can (watch and) listen to the archived TV broadcast then. But not only is that a waste of bandwidth, listening to the TV is not the same experience as listening to radio. Without the visuals, the TV commentary isn’t enough. I can listen to the games while traveling on my netbook (if I still lugged that around with me). I assume I could listen to them on Android phones and tablets, and probably Windows devices as well, since they all have Flash (although I don’t know for sure as MLB may disable something there). Three Springs in a row I’ve asked on the Gameday Audio Support Forum if on-demand would be available during the coming season. The first year the response was along the lines of “That’s a good idea, we’ll pass it along to the developers”. I see someone made the same suggestion about 10 days ago, with the response “We’ll pass this along to the developers”. An easy fix that would probably make a lot of people happy. Inexplicable why they don’t do it. 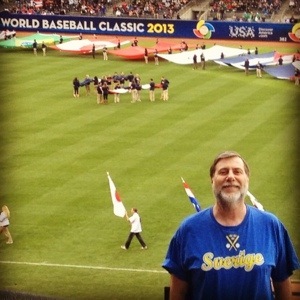 Been sadly neglecting this blog, but even though the WBC finals were two months ago, better late than never. 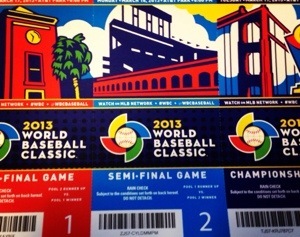 The three games in San Francisco were wonderful. There was the first semi-final between Japan and Puerto Rico, and Puerto Rico’s massive upset win over the two-time defending champions. The Japanese supporters were very vocal, and massively conspicous in their absence during the final (even though the tickets sold were three-packs). The Japanese apparently had special try-outs for the team, and really prepared for the tournament, but perhaps were hurt by not including any MLB players, like Ichiro. There was the second game between the Dominican Republic and upstart underdogs the Netherlands, who beat the Domincans twice in the 2009 tournament. This time the Dominicans were better prepared (and didn’t lose a single game). The Netherlands started a bit like the Puerto Ricans, but in the end were just outplayed. But their performance, reaching the semi-finals, was an amazing testimony to European baseball. In the final, the Domincans just outplayed the Puerto Ricans. It was fun to see Angel Pagan playing for Puerto Rico in his own part. One wanted to think this gave him an edge, but he did misjudge one ball hit to centerfield badly. Strange to be at AT&T without the Giants. Renel, the Giants’ PA announcer, was there, although she had to share the mike with Japanese and (especially in the final) Spanish-speakers. The mascot Lou Seal was also on-hand. And the stands were filled with Giants fans in Giants gear. When Dodger Hanley Ramirez came up to bat for the Domincan, the stands echoed with boos and chants of “Beat LA”. Just about the only negative thing was the weather, it got very chilly, and the final night it rained a bit. Fortunately we had seats on the Club Level that were under a roof, but we till took refugee from the cold behind the glass on the Club Level. That in itself was an amazing experience, with all the food and concession stands one could wish. We spent a lot of time inside, watching the game on the TV screens. Originally I didn’t want seats at the Club Level, I like to sit closer to the field and the plate, behind the first base dugout, for example. But we have the most amazing views of McCovey Cove and the Bay Bridge. I’m only at AT&T every now and then, but I’ve never seen the Giants Dugout Store there so crowded. 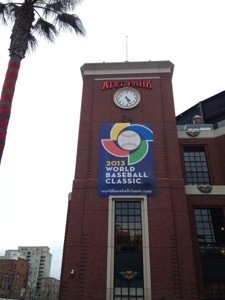 It most mostly filled with Giants stuff, of course, with the WBC merchandise sort of shoved into the corners. But that was where the crowds were, looking for gear from not just the four teams in the final three games, but for all the teams in the final rounds of the tournament. The opening ceremonies all three days were impressive. 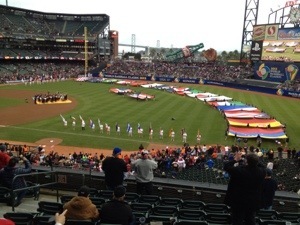 One little thing that irked was that among the flags of the competing nations were Britain, France, and Germany, all of whom were in the qualifiers for the WBC. Germany belonged there, but it continues to bother me that Britain and France were picked to take part, rather than Sweden, which has a better national team. As far as I know, Britain and France were included solely for commercial reasons, being bigger countries Major League Baseball felt that their inclusion would be more profitable. But, even if it had gone out at the very first stage, Sweden deserved to be given that chance. In game 1 of the best-of-five 2012 Swedish Baseball Championships, favored team Karlskoga narrowly defeated Leksand, 3-2. Game 2 will be played on Sunday.